Out of all of Shakespeare’s plays, Hamlet is both the longest and the most famous. For actors the title role is one of the biggest parts to perform, in terms of lines to learn and the role’s status as one of the most iconic in the English theatrical tradition. The Royal Shakespeare Company’s latest staging of the show is currently on tour, following a well-received production last year. But how can a play such as Hamlet, so often quoted and staged numerous times, be made to feel fresh? This production, directed by Simon Godwin, goes some way to reinterpreting the play and is, for the most part, successful in this endeavour. Recent years have seen the role of Hamlet played by critically adored actors such as Benedict Cumberbatch and Tom Hiddleston, while Manchester’s Royal Exchange Theatre shook things up by giving audiences a female Hamlet in the talented form of Maxine Peake. Godwin’s production eschews the more traditional interpretations of Cumberbatch and Hiddleston, and offers a new perspective on both character and the drama which surrounds him by presenting this production of Hamlet within a post-colonial setting. In this version, ‘Denmark’ appears to be in Africa, rather than Europe. Purists (and Geography pedants) may balk at this but it injects an interesting energy into the production: one of the classic English texts becomes repositioned into a commentary on the fate of former colonies in Africa and how ideals can become corrupted. This is indicated most strongly through the scheming Claudius, silkily played by Clarence Smith, whose first appearance sees him in full military uniform and latterly in suits and shirts which are reminiscent of those favoured by the recently deposed dictator of Zimbabwe, Robert Mugabe. The conflict between tradition and modernity is made starkly clear by contrasting the modern attire of Claudius the usurper with that of the more traditional tribal garments worn by the ghost of Old Hamlet. While more could have been made of this angle, it still offers an interesting attempt to make us see this familiar play anew. The production takes some interesting choices with regards to its staging: the play opens with a brief prologue where we see Hamlet graduating at Wittenburg University, before his father’s death prompts him to return home, and he witnesses his Uncle Claudius swiftly become his mother’s new husband and assumes the throne of Denmark. Aside from one line at the very start, this prologue communicates the backstory to Hamlet’s return with an effective blend of sound and lighting - the transitions between the university and the father’s funeral and mother’s re-marriage are seamless. This production integrates music effectively, African rhythms abound throughout, representing diegetic music (when the players arrive in court), supernatural effects (before the ghost appears to Hamlet), and battle music (in the final duel between Hamlet and Laertes). The play is modern dress, and Hamlet’s costumes are interesting: he begins all in black, still mourning his father’s death but, after the visitation from his late father’s ghost, he arrives in colourful clothes. With drawings and splashes of paint over them, the colours offsetting the melancholy he feels at his father’s death, enhancing the feeling of those closest to him that he has gone mad. Of the ensemble cast, there are highlights from Joseph Mydell’s Polonius, who provides much comic relief during the first half of the production. Indeed, his death early in the second half indicates that the play is taking a darker turn as the play reaches its climax and bodies litter the stage. Polonius’s daughter Ophelia is brought to life vividly by Mimi Ndiweni who goes from being a playful young lady at the start of the play to a broken, grief stricken wretch in her final scenes: here Ndiweni’s performance shines as she sings of her father’s loss and stalks the stage with menace as she struggles to comprehend what happened. But what of the title character? Paapa Essiedu’s performance is fascinating: his Hamlet has a vibrancy, a genuine sense of mania as he plots to expose his Uncle’s murder of his father. He is often sarcastic towards those he considers beneath him, light on his feet and quick to speak. 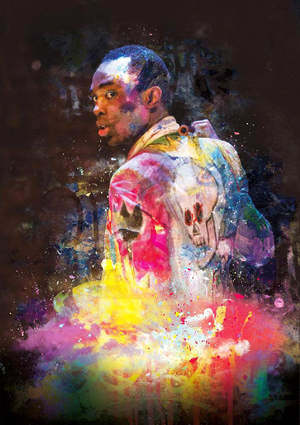 This interpretation of Hamlet highlights how much of an artist the young Prince is: he performs for the players, writes ‘The Mousetrap’, and paints street-art. But while his outward appearance is full of youthful energy, Essiedu brings it down for the big introspective monologues. It’s a performance which deserves the praise it has already garnered and will continue to generate. The production is on at The Lowry until Sat 3rd Feb. It’s well worth checking out, even if you have seen Hamlet countless times as this staging makes the play feel brand new.